A-SAFE is shortlisted for two coveted design awards, continuing its industry success. 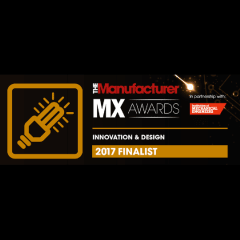 The workplace health and safety solutions inventor, manufacturer, supplier and installer is shortlisted for Design Team of the Year for new racking damage detection solution RackEye™ at the British Engineering Excellence Awards and Innovation & Design at the MX Manufacturing Awards. RackEye represents A-SAFE’s first move from protection to detection solutions, and is the first of its kind product internationally. The combined device, remote app and digital dashboard provides 24/7 monitoring of racking integrity and real-time alerts, recording every impact but only alerting nominated users when the impact has caused structural damage to racking. The patented algorithm means the device can differentiate between every day knocks and impacts causing damage. This means facility managers can conveniently control a multi-site network of racking structures from any location, with the aim of increasing site safety, decreasing downtime and encouraging safer driving. Both awards events take place in Q4, with the British Engineering Excellence Awards lunch on Thursday 5 October at the Honourable Artillery Company in London, and the Manufacturer MX Awards on 16 November 2017 at the Kings Dock exhibition centre in Liverpool. This year, A-SAFE has achieved several industry awards to cement its stance as a global industry leader, exporter and product innovator; featuring in the HSBC International Track 200 league table for the fourth consecutive year. The team also won the Advanced Manufacturing Innovation Award at Business Insider’s Made in the UK Awards – one of the UK’s largest national manufacturing awards dinners.